Having extreme weather in Russia, the people still can manage to consume any kinds of fruits they want. The wide range of popular fruits can be found both in their dachas – a summer house outside the city where people grow their food- and in food market imported from overseas from some tropical fruits. Russians have many kinds of delicious and fresh apples which become the nation’s popular fruits. They grow the apples in the gardens during deep autumn and harvest it before the winter. The varieties of apple are including Antonovka, Bogatyr, Simirenko, Anis and Moskovskoe Zimnee. You can easily find the apples in the local market since Russia is famous with their apples production. They usually consume apples freshly after picking it up from the trees. The taste will be so fresh, sweet, juicy and little hard. Another way to enjoy apples for local Russian is by making it into juice, salad, wine and jams. Russian apricots has Latin name that is Prunus Sibirica. The taste is unique and different from the European apricots. It was originally from the Siberia, but has been planted in all over Russia nowadays. The perfect season of harvesting is around July-August. The best varieties of apricots and the most popular are Alexander, Alexis, Catherine, Gibb, and J. L. Bud. Since it belong to popular fruits, it is very easy to find around Russia. Just go to the local market, or modern market which scattered in the country. The taste tends to be sour and acid, but in the latest variety you can feel sweet apricots. It usually consumed as dried fruit or can be used as the main ingredients for making delicious chocolate-coated dried apricot. Kind of popular candies in Russia which can be consume. Besides, it can also be made into kompots, non-alcoholic sweet drinks. A small roundish juicy fruit is the best definition to describe the nation popular fruits to consume in Russia. The fruits can grow in a very harsh winter conditions, and most babushkas usually sell the berries directly to the customers. In St. Petersburg for example, you can see rows of street local seller who sells berries fresh from the trees. 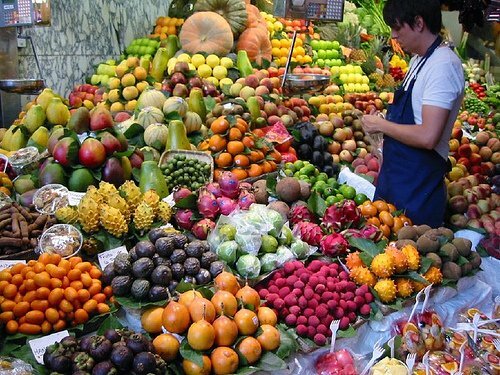 Besides, you can also find numerous fruits seller in Siberian market. It usually collected around July until August. There are many types of berries in Russia; they are blue honeysuckle berries, strawberries, raspberries, gooseberries, blueberries and sea-buckthorn berries. Besides eating it straight from the tree, the Russian usually love to make a homemade jam with their favourite berries. and at some occasion, they will make special cake or bakery with berries as one of the ingredients. You can feel the real taste of local freshness; some of them might taste sweet, while the other could be bitter or soar. Tangerines as known as mandarins belong the one of the most popular fruits to consume in Russia. Actually it was originally become a must have fruits to be served in once in New Year eve festive celebration since Soviet Time. But nowadays, they don’t need to wait for a whole year to eat this sweet fruits. Since now, the fresh and sweet tangerines can be found everywhere, both in traditional or modern market. Tangerines are winter fruit, the Russian fruit seller usually imported it from Japan. The peak season of demands is around December, because Russians are getting ready to welcome New year with this fruit to symbolize wealth and prosperity. They usually just eat it directly to feel the freshness, between sweet and little sour for some tangerines. Having the same family as tangerines, oranges tends to be bigger than the other varieties. It has bright orange skin and contains a lot of important vitamin C which is needed for our body. Oranges are originally from Asia. It is very easy to find it in Asian country like China and Japan. But now oranges also grow in United States -the famous variety is Florida orange. Along with tangerines, they are lots of famous orange family such as Satsuma, clementine, dancy, honey and pixie. Russian tends to served oranges as fruits. While for some families, they will make it into salads or use it as the cake decorations. Along with apples, pears also belong to one of the popular fruits to consume in Russia. There are two types of pear, the local pears and imported pears. The most famous local pears is larinskaya pear. It tastes so juicy, crisp, and flavourful. It tastes perfect for those who prefers taste which is not too sour and not extremely sweet. The production of local pear is not enough to fulfill the nation demands, so the seller has imported in a big number to Russian people. For imported pears, the most popular is pear from United States or USA pears. It is sold in a modern market everywhere in the city. It is so good from directly fresh consumption or can be used as a cooking ingredient such as salad and juice. Russians has produced their own plums in the dacha. It was usually harvested in September, near the coming of winter season. There are three types of plums; egg blue, blue-eye and yellowish-red. Consuming it fresh or make it into pie, the choice is yours.